There's an updated version of the program in the link below. It now includes a .NET version of Jeff's WBCD box modeling program, along with a splicing tool. It uses the same Benson model that Jeff used for WBCD, which is more accurate than other box modeling programs. It's got a totally re-written interface for the crossover design module, and I made the schematic options the same as what Jeff used in PCD, so it should be a bit more familiar to PCD users. It also imports CSP files so you can test it with existing PCD designs. And as with the previous version, you can model the bass boost circuit in plate amps and design Linkwitz Transform circuits. It's got a lot of other changes--more Help files, ability to change colors as well as customize the charts. As before, most of the values can be entered by scrolling with the mousewheel, so data entry can be very fast. With the box modeling tool, the program should be more fun to use. There is a Response editor for modifying the FRD data that lets you view and change individual values and extract phase using an FFT-based algorithm. There are a couple of additional features still not implemented in the Response editor, but those will eventually get finished. As before, it saves and loads the program state using an XML schema that is described in one of the help files. 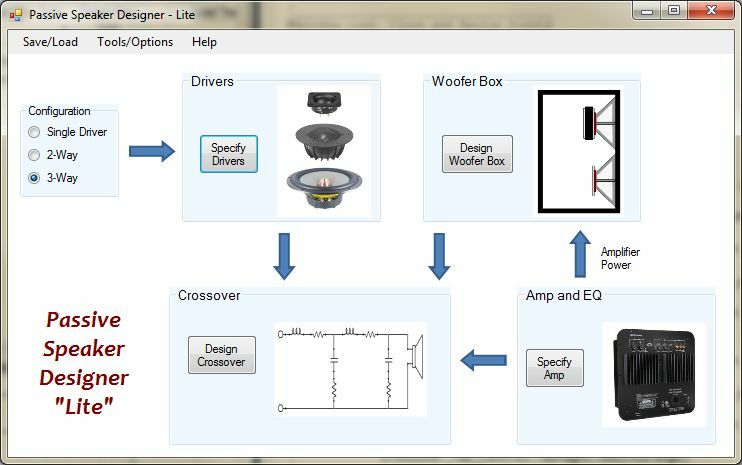 So it is a completely "open" format that can be used to exchange data with other loudspeaker design tools. This program is a spin-off of a larger program (PSD), and it hasn't been tested much, so I apologize if anyone wastes time tripping over bugs and gets confused by things that aren't logically organized. I'll make some quick fixes if someone points them out, but I'll be leaving the PSD programs alone for a while to shift attention back to the active version (ASD). But I wanted to make this available for people to play with and maybe get some feedback that will help me with the other programs. I'll have to check it out. I just started using Jeff's PCD, and while it's incredibly useful, relying on Excel for a UI also makes it incredibly cumbersome. That kind of power deserves equal effort to the interface. See the setup log file located at 'C:\Users\MARINO\AppData\Local\Temp\VSDA708.tmp\in stall.log' for more information. Hmmm...hadn't heard of that one. But it sounds like a "permissions" issue, since .NET4 and the Windows Installer should run fine on Vista. Try unzipping the files and look at their properties, and remove "blocked" attributes. You may need to run the install.exe as administrator. I don't have Vista anymore so I'm having to guess at the steps. I think it's an interface that an engineer will love :D. It's schematic-centric, which most tekkies will find intutive and others may not like. It was tedious to implement: every component and line gets "drawn" using Paint operations, and there are many, many lines of code required to draw the schematics--far more than I expected. But I think the end result is pretty nice. My first attempt (Beta 1) was just using textboxes plopped onto a graphic of a schematic, but I did it during a short hospital stay on a laptop, so it was rushed. This version is a lot more satisfying--more what I had in mind originally. That did the trick,,,thanks!...Working good! Why can't EYE see a link? Yes, thanks Bryan. Wha up wit dat? Any one know if or how I could install this on my android phone? You can add a signature to your posts, and that is where I put the link. Kinda lazy, but it was already there so I just referred to it as "below". I guess it's easy to miss if you tend to ignore all that signature information that some people have. Anyway, give the program a try...it's fairly fast and it's easy to use. It should be as accurate as the comparable Excel tools. It's got a built-in PCD importer (it reads the CSP file) and if there is enough interest I could add a CSP exporter so you could easily go back and forth for comparisons. Please have fun with it--all I'm hoping for in exchange is some feedback to help make it more useful.